Long Term Care Insurance rate increases, can they happen? Yes they can. Strategies for hedging the risk of Long Term Care Insurance rate increases. A few things in life are certain: death, taxes, and possibly inflation. Everything seems to increase in price as time goes on. Long Term Care Insurance is a little bit different. While the companies reserve the rights to increase rates in the future, not all have. And some carriers, in fact, project future dividends that can actually offset Long Term Care Insurance rate increase. So while there are Long Term Care Insurance rate increases in some carriers’ pasts, for the most part with the big brand name companies, the premiums have been increased responsibly. The reality is, Long Term Care Insurance has been around since 1974, and the companies are always improving their actuarial tables to reflect claims experiences. This is a good thing for you as a buyer because they are able to predict the risk with more accuracy and, in theory, keep premium rates more stable. Buying Long Term Care Insurance from a company just beginning to sell the product may not be a good idea. Until a carrier has seen actual claims data, they may have trouble assessing the risk properly. After all, actuarial types with the government can’t even keep Social Security solvent. Just as, in the 60’s, the government screened Medicare/Social Security wrong, new insurers may not screen buyers properly and take on too much risk. Buy from a company that has been selling Long Term Care lines for at least 15 years, if possible. For example, Genworth Financial is the oldest Long Term Care Insurance company; and since 1974, has had to increase premiums three times, up to 98%. Several of the “newbie” AAA rated carriers tout no rate increases, yet have not been selling policies long enough to see peak claims and hence need increases. 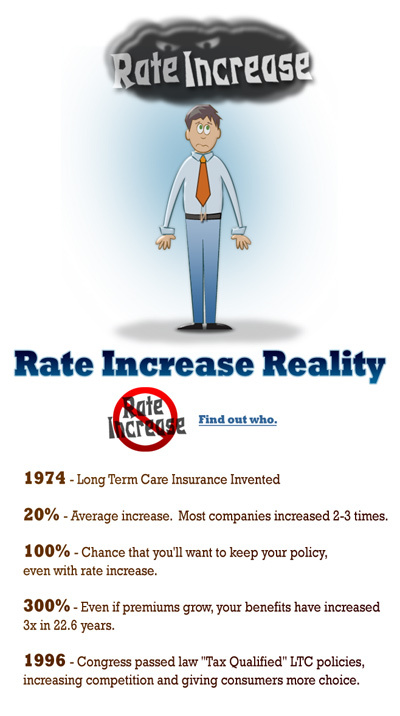 Genworth’s first rate increase was nearly 38 years after they sold their first policy. Most all insurers reserve the right to increase Long Term Care Insurance rates, and even A+ rated carriers can raise rates, so the link between financial stability and rate increases is not as strong as it once was believed to be. There are some things to be aware of though. Even the big companies can and will raise rates, but typically the companies who have experience and solid financial ratings will raise rates less dramatically than the smaller carriers with worse financial rankings. At LTC Tree we work with all the major “blue chip” Long Term Care Insurance companies, and have an understanding of the Long Term Care Insurance rate increases history of all the carriers and will lay that info out for you to judge for yourself which company you’d like to instill your trust in. There are several ways to completely remove any risk of future Long Term Care Insurance rate increases. There are single-pay Hybrid Long Term Care insurance plans that are offered by ten plus blue-chip companies. A common premium for a 62 year old would be $100,000 one time and then it’s paid off. If long term care is not needed then the policy’s life insurance benefit kicks in and would return the original $100,000 back to the family tax free with interest. If you would like to learn more about Hybrid-Long Term Care Insurance plans or how traditional plans may increase over time and how to plan for that potential, fill in the form below.